i.materialise is a web-based 3D printing service provider. You give them a computer model and some money, and they send you a physical model in return. Pretty simple, really. Except that 3D printing is usually anything but simple. Printing SketchUp models involves file conversion, scale conversion and quite a bit of checking for mysterious things like "watertightness". With demand for rapid prototyping on the rise, companies like Materialise (and a few others) are doing their best to make the SketchUp-to-object printing process easier than ever. The new SketchUp plugin from i.materialise is essentially a wizard: After installing it, you open a model, launch the plugin and go through the steps. 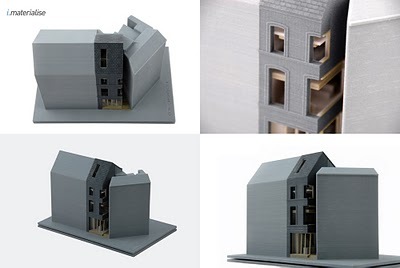 You scale your model to make it fit on the printing "plate", indicate areas of glazing (transparency), and even add ready-made elements (like trees) from a collection of "guaranteed-to-print" objects supplied by i.materialise. When you're ready, the plugin lets you one-click-upload your prepared model for printing. To kick things off, the folks at i.materialise have even sponsored a little competition. The World of Houses SketchUp Design Challenge invites anyone to submit a SketchUp model for consideration. A jury (of which I am a part) will pick their three favorite models; the winners will receive a printed model as a prize. Take a look at the challenge website for all the details, but do it soon -- the deadline for submissions is May 24, 2010.